Three are reportedly dead after Cambodia’s military police used live ammunition on demonstrators. At least three people have been killed in Cambodia after security forces opened fired on protesters demanding higher wages, Reuters is reporting. Cambodia has been the scene of labor protests since last month. The protesters reportedly consist of disgruntled factory workers demanding higher wages and elements of the opposition Cambodia National Rescue Party (CNRP), which is demanding that the government hold a new election because they claim the one held over the summer was rigged. On Thursday, scores of protesters were injured when security forces beat demonstrators with batons. 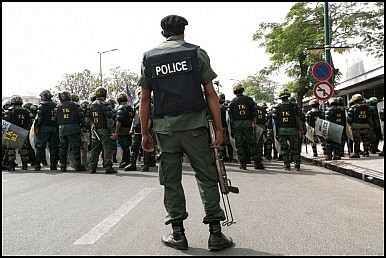 On Friday the Cambodian military police opened fire on protesters with assault rifles, according to journalists on the ground. Although Reuters is reporting at least three protesters were killed, the Cambodia military police claim only one died in the assault. The CNRP have rallied unions and factory workers to its side by promising to nearly double the minimum wage if another election is held and it emerges victorious. Prime Minister Hun Sen, who has ruled the country for decades, has so far refused to hold another election. The Cambodia government is also refusing to raise the minimum wage beyond $100 a month. The minimum wage is currently $95 but the Cambodia government announced a hike of $5 earlier this week. That hike will go into effect next month, the government said. Last month it announced a $15 increase in an effort to get demonstrators to return to work. The CNRP has promised to raise the minimum wage to $160 a month if it comes to power. Cambodia has a lower minimum wage than many of its neighbors like Vietnam, Thailand, and China. This has allowed it to attract foreign investment from multinational companies. Workers disgruntled with the low pay began striking last month. Labor protests have been a fairly frequent occurrence in the country in recent years. The Life and Near Death of Sam RainsyHun Sen's Monument to HimselfCambodia’s Opposition Begins to CrackWhat Do Prisoner Releases Mean in Hun Sen’s Cambodia?A New Era for Hun Sen’s Cambodia?